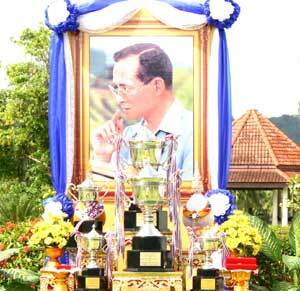 50 years of age on the first day of the tournament. ASM tournaments are staged over a 1 week period, Monday - Sunday, and preceded by 2 ASM Amateur Pro-Am Qualifier events, and up to 6 ASM Pro-Ams staged in a 3 amateur & 1 Professional golfer format. The amateur golfers wishing to participate in the ASM Pro-Ams and the Amateur Pro-Am Qualifier events can be of any gender, but must be at least 12 years old, exemptions may be made based on merit and at the AST’s sole discretion on a case by case basis. ASM events offer their Sponsors unparalleled CRM, networking, branding and promotional opportunities, to interact with both your VIP guests, and the numerous other participating golfers. Sponsors and their CRM Managers are able to freely interact with ASM participants in a relaxed and informal manner during the Pro-Ams and at the post game functions, to be staged Tues through Thursday; at the ASM Welcome Cocktail Reception; by attending the 3 days of ASM Professional tournament Friday - Sunday, walking the course, and watching the ASM whilst enjoying the F & B and privacy in the ASM VIP Hospitality areas; via the numerous branding opportunities on the golf course and via the large amount of Print Media and the TV coverage, and exposure generated for and by ASM events. US$ 250,000 prize purse ASM event, making their ASM event the largest Senior Professional Tournament in Asia outside of Japan, this would require a US$ 400,000 sponsorship investment. ASM events also offer their naming right sponsors, significant corporate promotional exposure, via the numerous Corporate, Charity and Social Club golf events at which ASM Invitational Amateur Pro-Am Qualifier places, and ASM Pro-Am flights are offered as prizes. ASM tournaments are heavily focused on amateur participation, involving over 800 amateur golfers, making them the largest Pro-Am events in the world with a RECORD breaking 6 Pro-Ams and 2 Amateur Qualifier events catering to over 800 amateur golfers ALL staged during the tournament week. In addition to the wonderful experience of playing in ASM Pro-Am tournaments, an added attraction for the ASM Corporate Sponsors and the competitive and serious low handicap amateur golfers is the opportunity for the 9 "best gross" scoring participants from each Pro-Am to secure places in the ASM Amateur Semi Finals to be staged on Friday and Saturday incorporated into the first 2 days of the ASM Professional tournament, each flight will be played in a 3 Pro & 1 Amateur format. 70 amateur golfers derived from the 54 who qualified via the 6 ASM Pro-Ams along with 16 sponsor's exemptions, (who's entries MUST have a handicap of 10 or lower) will contest the ASM Amateur Semi Finals competing head to head with participating Senior Professional golfers under testing tournament conditions. The 3 "best gross" scoring amateur participants from each ASM Semi Final 6 amateur ASM Amateur Finalists in all will contest the ASM Amateur Finals to be staged on Sunday. T Off will be prior to the Final Round of the ASM Professional Tournament. ALL ties in the final round of the ASM Professional Tournaments and the ASM Amateur Finals will be decided by a sudden death play off. Numerous competitively priced Corporate Sponsorship packages are available and if required individual custom tailored ones can be created. In addition to using ASM Pro-Ams as stand alone CRM tools, many companies have also invested in Corporate ASM Pro-Am flights and Sponsors benefits as a way to enhance their existing corporate and customer golfing events by offering ASM Pro-Am flights and other Sponsors benefits as prizes award to their VIP customers, business partners, and colleagues. Each of the 6 ASM Pro-Am tournaments, catering to 96 amateur participants is an event in itself, with individual, corporate team and novelty prizes, etc incorporated into the sit down post game function. The Open Amateur Pro-Am Qualifier will be played OFF THE STICK and the 9 "best gross" scoring individual participants and the top 2 ball team entries, 13 amateur golfers in all will secure places in the ASM Pro-Am to be staged on Thursday. 128 invited Malaysian & Singapore amateur golfers, winning places via the numerous Corporate, Charity, Social Club, Golf tournaments and other events which ASM supports & sponsors and Media invitations. The Invitational Amateur Pro-Am Qualifier will be played OFF THE STICK and the 12 "best gross" scoring participants (4 ladies, 4 men, 4 juniors) secure places in the ASM Pro-Am to be staged on Thursday. All ASM Pro-Ams and Amateur Pro-Am Qualifier events include a light meal prior to T-Off, on course refreshments, and are followed by a sit down buffet meal and prize presentation ceremony after the golf game, with the exception of ASM Pro-Am 2 and the Invitational Amateur Pro-Am Qualifier where the prize giving ceremony is incorporated into the ASM Welcome Cocktail Reception. between 600 - 700 guests, including AST Professional golfers, their companions, the Media, Sponsors, Sponsor’s Guests, all participants of ASM Pro-Ams, both the Invitational & Open Amateur Pro-Am Qualifier events along with ASM Officials and Volunteers are invited to attend the Welcome Cocktail Reception. Sponsor’s & their VIP Guests are provided with F & B in the form of a running Brunch – Tea in the clubhouse from 9.30 am. - 4.30 pm. Prize Presentations Clubhouse - Terrace – approx 3.30 pm. After the ASM Professional Day 2 the field will be cut to the top 75 best scoring participants including ties who will contest the final day of the ASM Pro tournament. 2 flights - 3 Amateur Finalists with provision for up 2 VIP golfers to be included. Sponsor’s & their VIP Guests are provided with F & B in the form of a running Brunch – Tea in the clubhouse from 6.30 am. - 4.30 pm. Prize Presentations Clubhouse - Terrace – approx 4.30 pm. In order to cater to overseas based Companies, and individual amateur golfers, various ASM Pro-Am and social golf packages are available which include up to 6 nights accommodation at the ASM Official Hotel, 1 - 3 Pro-Ams games and the opportunity to play between up to 3 rounds of social golf on some of the beautiful golf course near by. We look forward to welcoming those of you who will be attending an ASM event for the first time, and to seeing past ASM participants, both AST Pros and amateurs alike, where together we will once again experience and relive the most enjoyable ASM tournament atmosphere, the excitement of amateur participation, the good-natured competitiveness and rivalry that is enjoyed by the volunteers, spectators, amateur golfers and senior professional golfers alike. Once again members from the Asian Seniors Tour, representing senior professional golfers from around the world gathered this time in Johor, Malaysia to contest the 2005 ASM @ Palm Resort, where Kuala Lumpur based, Australian Stewart Ginn who has won the Malaysian Open twice reigned supreme, defeating Korea’s, Choi Yoon Soo's defense of his 2003 ASM Singapore Championship Title at the recently concluded 2005 ASM @ Palm Resort. 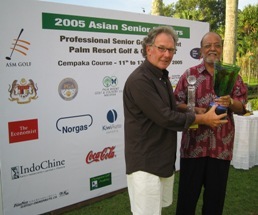 Stewart Ginn won the 2005 ASM tournament at Palm Resort Golf and Country Club today without ever having lost the lead. Ginn completed the tournament with a two-over par final round of 74 for a 54-hole total of 219. As predicted yesterday, his nearest challenger, fellow Australian, Randall Vines, did manage to creep up the leader board to tie Ginn, at three-over par, when Ginn dropped a shot at the par-4 13th hole. Although Vines eventually went on to complete his round with a one-over par 73, one better than Ginn’s final round of 74, his final-day performance was not quite enough, as he finished two shots behind Ginn’s final three-round total of 219. Third place was shared by two players, following a tie between New Zealand's John Williamson, with a final round of 76 for a 224 total, and past Malaysian Open Champion, Australian Brian Jones, who made a late rush with a final round one-under par score of 71, also for a total of 224. Taiwan's Cheng Tsang Te finished in fifth place with a three-round total of 225, followed in sixth place by New Zealand's Richard Ellis who equaled the final day's best score of (71) to finish with a 226 total. Others tied at 226 for 6th place included former Malaysian Seniors Open Champion, Australian John Clifford along with Philippines representative Reynaldo Alit and Taiwan's Legendry, Hsieh Min-Nan captain of the Dynasty Cup Team. In his first appearance on the Asian Seniors Tour, Malaysia’s rising senior star, M. Ramayah, finished with an impressive tenth position, with a 54-hole total of 227. The clash of the rising amateur stars of the future saw no let up, as Singapore’s, Feldman Tan from (SICC) proved that his performance throughout the week was no 'flash in the pan', completing an arduous week with an impressive amateur performance of a 77 on an extremely testing 7,065 yard course, to take the ASM Amateur Championship title by one shot from Malaysia’s Ng Yau Loong from (Royal Johor GCC). Malaysia’s Paul Lim from (Palm Resort) took third place with an 81, followed by the very impressive 14-year old Singaporean junior, Lion Goh from (Laguna National GCC), who carded an 82. The AST wish to thank Tan Sri Elyas Omar, the Malaysian Commissioner of Sports pictured with 2005 ASM @ Palm Resort Champion Stewart Ginn who so kindly took time from his busy schedule to Officiate at the ASM Welcome Cocktail Reception, on Tuesday and graciously returned on Sunday, as Guest of Honour to present trophies to the winners. In his closing speech Tan Sri graciously closed the tournament by thanking all concerned and pledging the full support of the Ministry of Sports for the proposed 2006 Asian Seniors Tour events in Malaysia. At the 2003 ASM spectators and competitors witnessed the nail biting sudden death play off on Sunday 9 Nov 2003 when Korea's Choi Yoon Soo defeated Canadian John Irwin on the first hole of a sudden death play-off, sinking a 3 meter putt for a birdie on the par 5 - 18th hole to clinch the inaugural 2003 ASM – Title. Tied for third were first round leader Terry Gale from Australia, (then ranked 3rd on the EST 2003 order of merit), second round leader South African Tienie Britz and John Benda from the USA. They were followed tied in sixth place at 2 under by Mike Ferguson from Australia, Kuo Chie-Hsiung from ROC Taiwan and Mario Siodina from the Philippines. 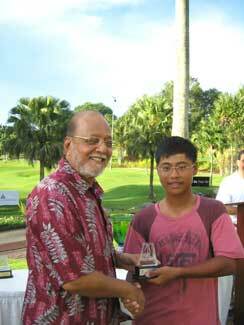 Singapore's leading amateur, Choo Tze Huang at the time only 15 years old with a 0 handicap won the IndoChine ASM Amateur Open Championship trophy with a gross score of 72 and Team IndoChine's Mark Lamb came second, and we look forward to their defense of their titles at the 2005 ASM @ Palm Resort. 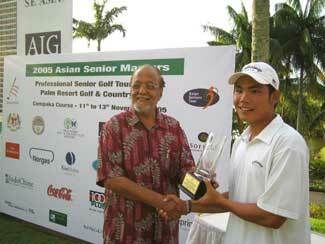 In 2003 thanks to the hard work of the Jurong Country Club's staff and the event volunteers, the hugely successful 2003 ASM - Singapore tournament, accommodate some 662 rounds of amateur golf on 1 golf course, conducted in 6 back to back shotgun starts, quite a feat in itself, however in 2005 the expanded ASM event format involving a staggering 1,000 plus rounds of golf to be played during the tournament week, now requires the use of 2 golf courses, hence the relocation to Palm Resort in Johor. 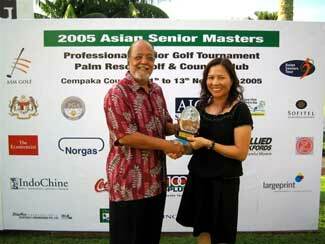 Click HERE to view photographs on the results page for the 2003 ASM – Singapore. 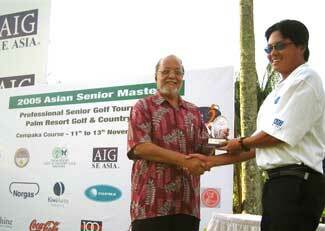 Click HERE to view the final scores on the leader board for the 2003 ASM - Singapore. 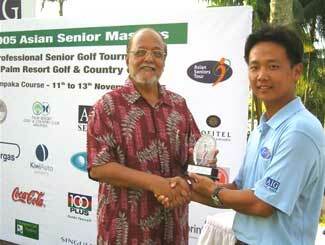 The Asian Seniors Tour was formed at a meeting between the various participating PGA which was held at the inaugural 2003 ASM - Singapore event click HERE for further information. The AST is always looking to expand and to stage more Asian Senior Master events in other countries in Asia and further a field, and we would be most interested to meet with golf clubs, event management companies, corporations and individuals who may wish to stage and own an ASM event in their country. The AST is able to stage an ASM event almost anywhere in the world, all it takes is a modest SGD$ 400,000 corporate investment which will secure Title Sponsorship of an ASM event, and cover the US$ 100,000 Prize Money, securing the golf course, construction of on course VIP hospitality areas and the TV production and coverage on ESPN/StarSports. Finally we wish to extend our heart felt thanks to the numerous people we do know who you are from all walks of life who have helped in so many different ways, going above and beyond the call of corporate sponsorship commitments and friendship to make the 2005 ASM @ Palm Resort possible and the success it was.